This wedding was held in Chicago where the couple met and lived. 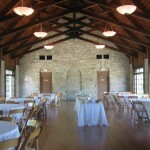 The location of the ceremony and the reception were set at a garden and a nearby 1930’s stone field house on Lake Michigan. The names on the documents in the images have been changed to respect the privacy of the couple, their family and guests. 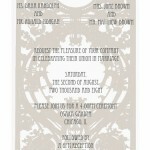 The graphics package and the décor for the wedding were based on the couples’ love of historic Chicago architecture. The backgrounds of each graphic piece were based on patterns in architectural elements of buildings from Louis Sullivan (a significant Chicago architect whose career spanned from 1887-1922). 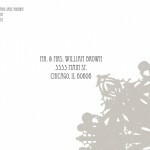 A local Chicago custom printer that touts “old world craftsmanship” produced the invitations, response cards and thank you cards using a combination of lithography (flat printing) for the background pattern and thermography (raised printing) for the text. This printer was appealing to the couple not only because of the rolled ink printing process quality but that they were a local family-owned business established in 1933. 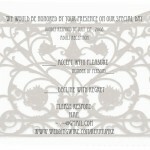 Because of the beauty and detail of the reception venue, the décor was kept to a minimum. Drawing from the natural elements of the venue, the color and materials of the décor were neutral, subtle and natural. The tables were clothed in cream color with simple wood chairs. 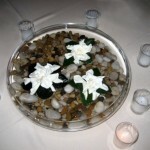 Each round guest table had a low round vase with rocks in the bottom and three white floating flowers surrounded by small votive candles. 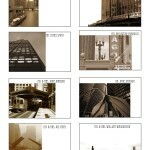 The tables were identified with a unique sepia colored image of Chicago that in turn appeared on the guest place cards. 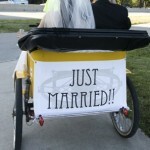 The couple traveled to and from the reception in a bicycle rickshaw. 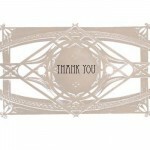 They arranged for a custom “just married” banner to be produced using the graphic that was also used for the thank you cards.